The NPR (National Public Radio) website has a brief article discussing the current zeitgeist in landscape photography. 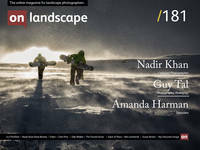 Triggered by a thought provoking article on Flak Photo called "Looking at the Land". They ask a few people about including Alison Nordstrom, a curator who put on the rerun of the New Topographic exhibition (yes that one, the one responsible for sooo many dull undergraduate exhibitions). Alison said to NPR "The whole point of landscape was traditionally to show 'that dichotomy between man and nature.' but that has changed: "We don't even know what nature is anymore". That's a pretty polarising opinion - thoughts?